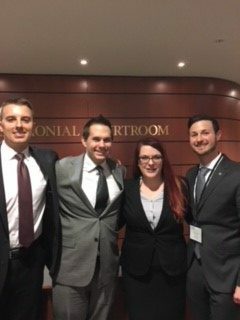 Congratulations to Mitch Bailey, Brian Laning, Nate Oesch, and Courtney Roelandts for their strong effort in the 2018 Philip C. Jessup International Moot Court Midwest Regionals in Chicago last weekend. In its 59th year, the Jessup Competition is the world’s largest moot court competition, with participants from over 645 law schools in 95 countries. This year’s Jessup problem involved the validity of interstate arbitral awards, the capture of a marine vessel, the breach of nuclear disarmament obligations, and the conduct of naval warfare. The team was awarded 7th Best Memorial in the Midwest Region. Congratulations! Attorneys and Marquette Law alumni Rene Jovel (Jessup 2014), Caitlin Noonan (Jessup 2012), and Gina Ziegelbauer (Jessup 2012), as well as Professors Ryan Scoville and Megan A. O’Brien served as team advisors. Special thanks to Juan Amado (Jessup 2011 and former team advisor), Jared Widseth (Jessup 2014) and Margaret Krei (Jessup 2013) as well as Attorney Nathan Kirschner for giving so much of their time to judge practice rounds this year. Thanks also to Jeff Perzan for volunteering his time. Congratulations to you and your coaches!